What comes to mind when I mention vitamin B12? 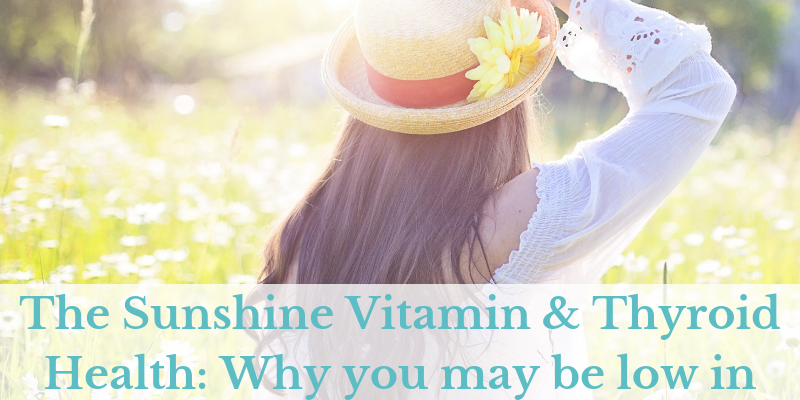 Most likely, you think of this vitamin as the energy vitamin or “weight loss” vitamin. Vitamin B12 does not cause weight loss. I will put that myth to rest! But, yes, B12 can help with energy, but only if you run low. 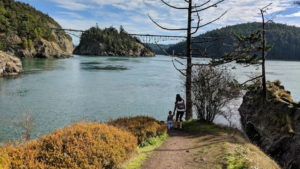 Contrary to what conventional medicine tells us (this website is not a substitute for medical advice), I find many people are low in B12. 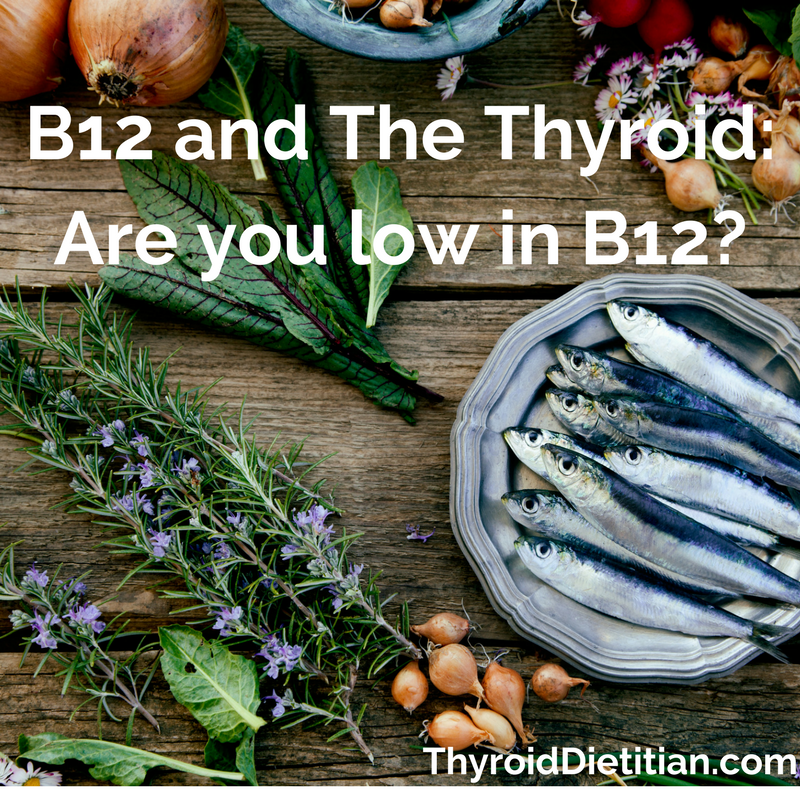 B12 deficiency is more common in those with hypothyroidsim. 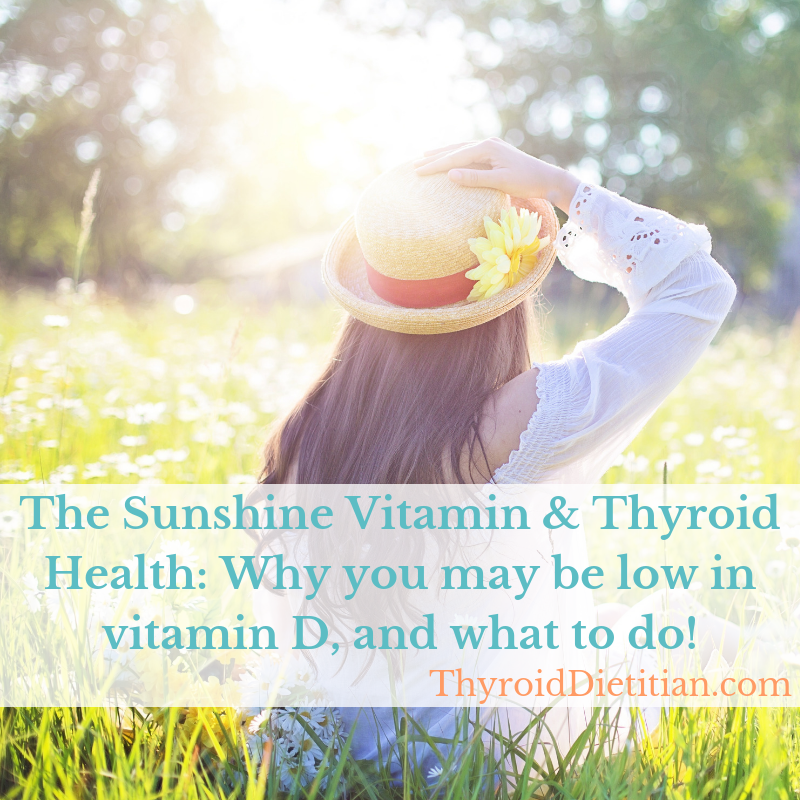 Some research states about 40% of those with hypothyroidism are low in B12. I have never been low in B12 that I know of. But, I have been taking a methylated B complex for years, so this may help me to avoid deficiency. 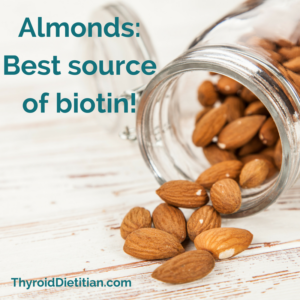 Without B12 it becomes much harder to make thyroid hormone! So, it becomes a vicious cycle. 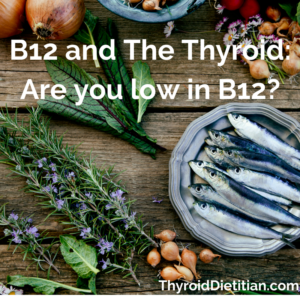 Then, that hypothyroid person low in B12 suffers low energy for both reasons: low B12 and lower thyroid hormone! Those with Hashimoto’s or Graves’ are at greater risk for pernicious anemia. And, those with autoimmune disease often have a harder time absorbing and using B12. 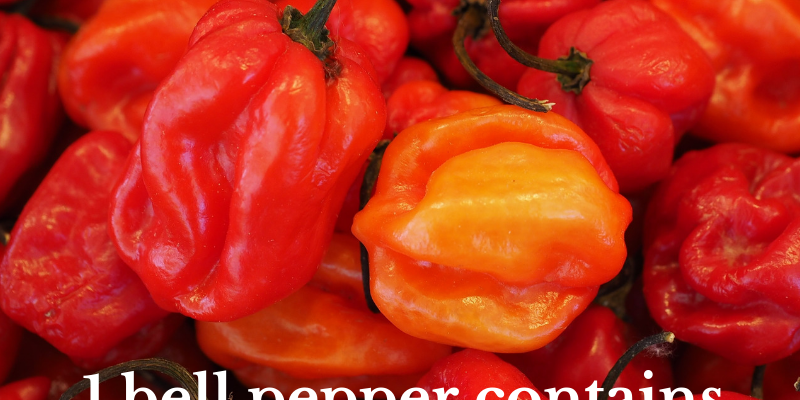 This may be due to intestinal system dysfunction, lack of stomach acid, or other digestive complications that may impair absorption. Get tested! A simple blood test can tell you your B12 levels. It is important to stay towards the higher end of the “normal range” as the low end of the “normal” lab range may still be a tad bit low. Next, work on those levels naturally by adding more potent sources of B12 to your diet! 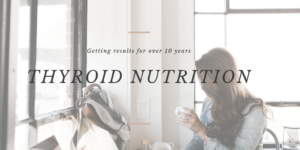 Supplementation is an option as well, but I recommend working with a doctor familiar with MTHFR genes or a Dietitian who is familiar with this as well. Fish is a very surprising and potent source of B12! Sardines and salmon (wild) are two of my favorite protein and B12 sources. They are fantastic! As you will notice, all of the below are animal sources. This is why eating vegan can potentially cause deficiency unless you manage your nutrition well by including fortified B12 sources. There are many wonderful vegan sources of B12, but these are mostly fortified sources and can be harder to absorb and use that B12. I think of vitamin B6 as a balancing vitamin that is needed for several functions: balancing mood, energy, staying strong, liver detox, and working in concert with other B vitamins and minerals. 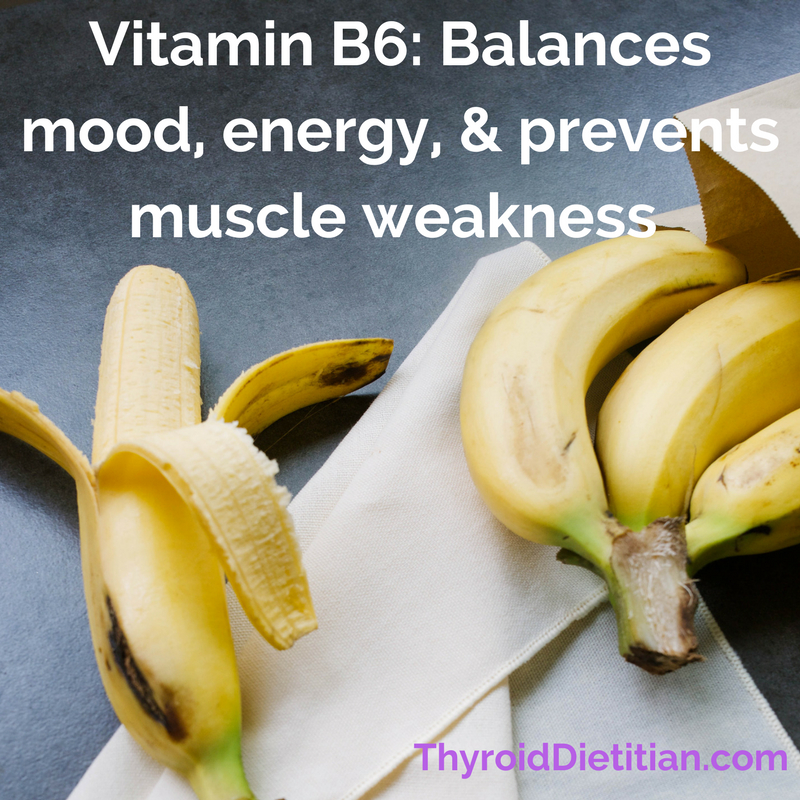 For the thyroid, vitamin B6 is crucial for working with iodine and helping to make thyroid hormone. In Graves’ and Hashimoto’s, the body relies even more on B6 since there may be times of hyperthyroidism. 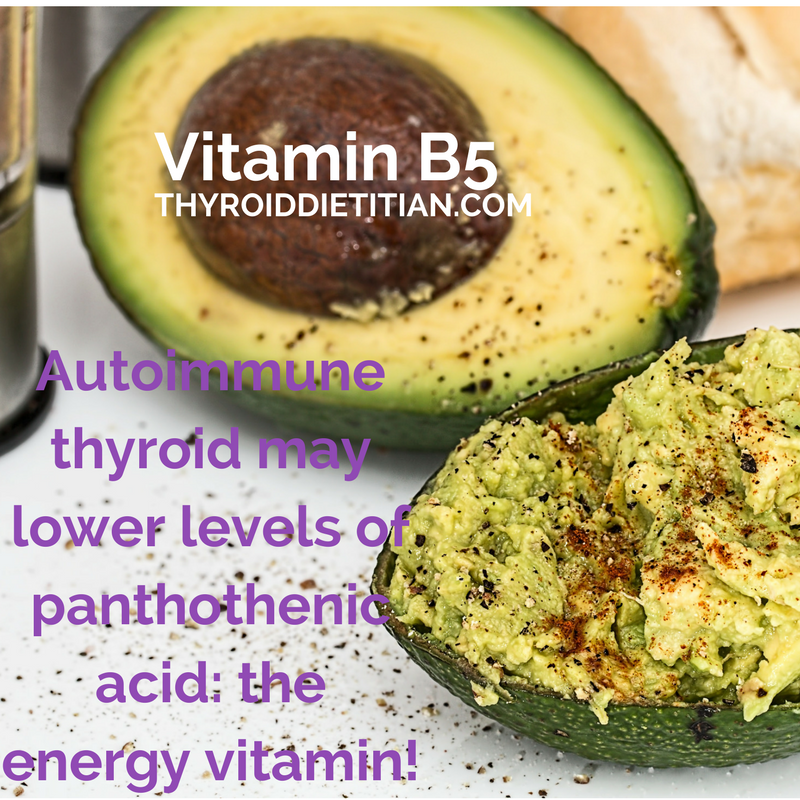 The body works hard to make more thyroid hormone during the bouts of hyperthyroidism and draws on suppy of vitamin B6. 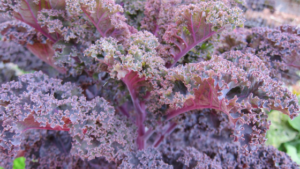 In the event of deficiency, muscle weakness can occur. 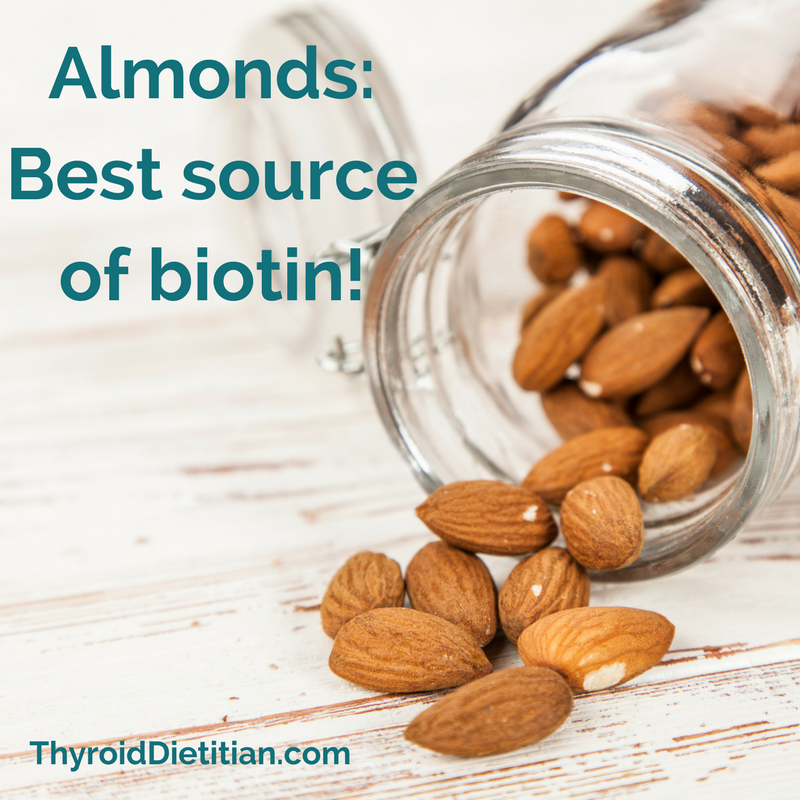 Lastly, if you supplement with thiamine (B1), it may lower your B6 levels. 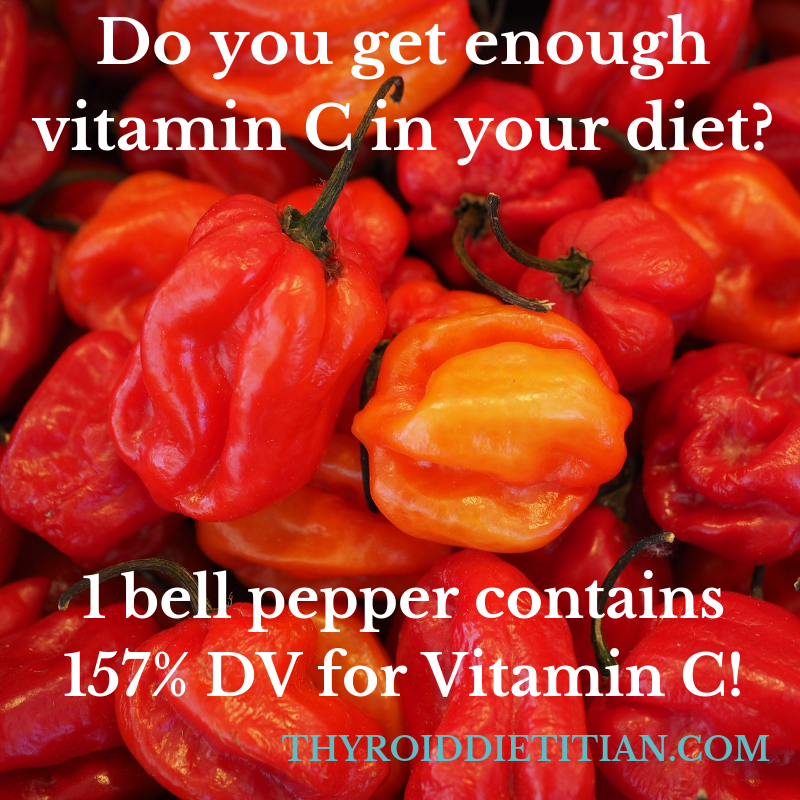 This shows more and more reason to not supplement with only one B vitamin, but to make sure you eat a balanced diet rich in B vitamins and possibly supplement with a quality multi or B complex. Factoid: Those who take oral contraceptives may be low in B6! And, those who suffer from mood disorders like depression may see benefit from increased B6 intake.